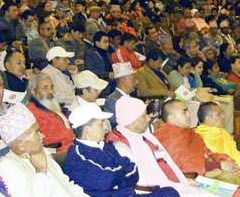 Several Peace Tour IV events were held in Nepal. 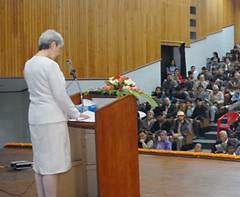 At the kick-off event, AFP Ms. Nin Sharyn Bebeau addressed a gathering of about 600 at the National Assembly Hall in Kathmandu. The Hon. Taranath Ranabhat, former Speaker of the House, congressmen, top religious leaders and many other distinguished VIPs were in attendance. The following day all three US Ambassadors for Peace addressed different events in Kathmandu, Pokhara and Chitwan. Mrs. Patricia Slabaugh addressed a high level gathering of 150 local VIPs at Dhyan Kuti Buddha Vihar. The Chief Abbot of the Monastery, Ven. Ashwogosh warmly welcomed her before the speech. "My God is in your heart and Your God is in my heart,� she said before reading the Peace Tour message. After the event, the Nepalese Ambassadors for Peace promised to play more important and active role for the peace process in Nepal. Another event was held in near Pokhara city at Bhanubhakta Campus Hall with 120 participants addressed by Rev Dr. Damon S. Roach. 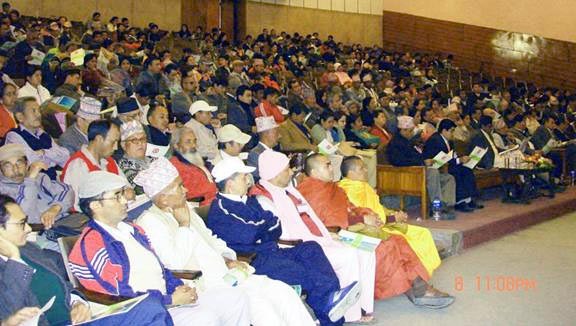 He encouraged all participants to �support True Parents peace movement if they would like to see peace in their home , nation and world.� Ten local VIPs were appointed as Ambassador for Peace. Rev. Patricia Slabaugh speaks at St. Xavier Catholic Schools. 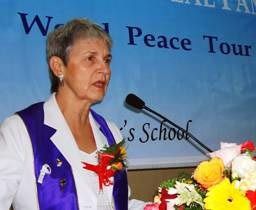 A St. Xavier's School, the Principal, Father Robinson welcomed the Ambassadors for Peace from USA, appreciating their efforts and the peace movement launched by Father and Mother Moon and the UPF. On the final day, the main program was held in the Russian Culture Centre with about 350 distinguished National Level VIPs, addressed by Rev. Patricia Slabaugh. �Nepal is a holy spiritual country and I always had a dream to visit here once in my life,� she said, �and today my dream became true. I have been supporting the works of Father Moon because he is truly dedicating and working for peace,� she added. Two more events were held in the city of Chitwan. Both were addressed by Ms. Nin Sharyn Bebeau. Even though it was not easy for her to give a speech at two places after traveling four hours by car on the same day from Kathmandu, she did not lose her spirit. 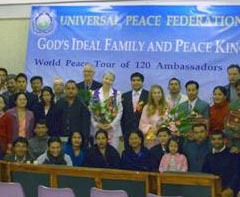 20 VIPs were honored as Ambassadors for Peace.